Recently confirmed in the September issue of Shueisha’s V Jump, Dragon Ball created, Akira Toriyama has confirmed that he is working on a new script for an upcoming Dragon Ball Z movie. Expected to open on Golden Week (May 3rd – 6th 20`5), the new DBZ film will feature new character designs and screen play from Toriyama himself. 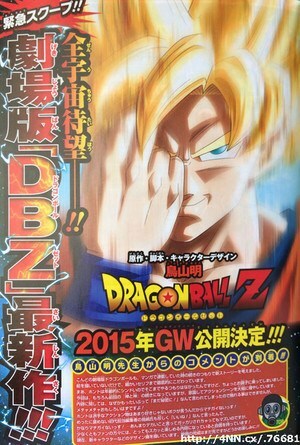 Not much is known about the plot of the film but per Toriyama the new movie it will be “utterly funny” and he asks his fans to look forward to the movie in 2015. Can’t say I’m not excited though I’d love to see an entirely new Dragon Ball series similar to Dragon Ball and Dragon Ball Z instead.